Since the completion of the 606 Trail in 2015, the condo market along the 606 Trail has been seeing significant appreciation and highly competitive, multiple offer scenarios are common. If you are searching for condos for sale near the 606 Bloomingdale Trail, it is essential to work with neighborhood real estate experts that specialize in real estate along the 606 Bloomingdale Trail. Choose Better 606 Trail Real Estate Agents. Contact Us Today! Entrusting a real estate agent with the task of helping you buy or sell a single family home, townhouse, duplex, condo or penthouse near the 606 Trail, is a big order. As a result, you are going to want professionals that possess the background and experience of The West Town Team at Keller Williams Realty. We are residential realtors who are recognized for handling real estate transactions near the 606 Bloomingdale Trail, West Town and Near West Side neighborhoods of Chicago. Furthermore, The West Town Team is armed with the newest, cutting-edge technology to deliver the best real estate services in the industry. In 2017, the Chicago Association of Realtors named us a “Top Producing Team.” That is no surprise to clients who are familiar with the fact that customer satisfaction is, and always has been, our top priority. Consequently, whenever clients are thinking about buying, selling or renting a home along the 606 Bloomingdale Trail, the only name they need to know is The West Town Team. 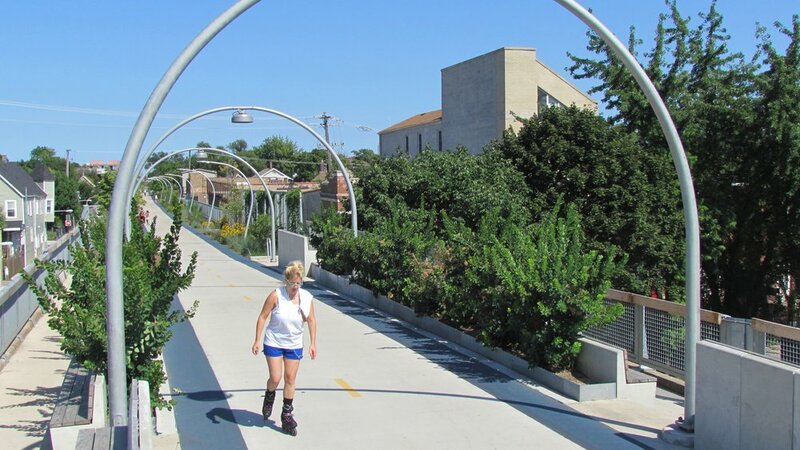 The 606 Bloomingdale Trail is part of Chicago’s award winning park system, and it is a nature trail, an exercise path, art corridor and bike commuter route wrapped into one. The 606 is connected to six ground-level parks and boasts 12 access points about every quarter mile. Most notably, the American Planning Association awarded it the “National Planning Excellence Award for Urban Design in 2016. With so much publicity and appeal, real estate along the 606 Bloomingdale Trail is definitely a hot commodity. The time to list your 606 home or to purchase a single family home is NOW! The pros at The West Town Team are available to help you narrow down your options. If you are looking for a condo or a duplex or a single family home, there are still plenty to choose from, but don’t wait too long! Prices along the eastern half (606 East) in Bucktown and Wicker Park are at a premium. There’s more diversity and better pricing heading west to Logan Park and Humboldt Park (606 West). To schedule an appointment with a 606 Trail real estate agent about buying a home or selling your home, call The West Town Team at: (312) 767-7504, today for the personal attention to which you are entitled. Questions about Buying a Condo on the 606 Trail? Contact Us!